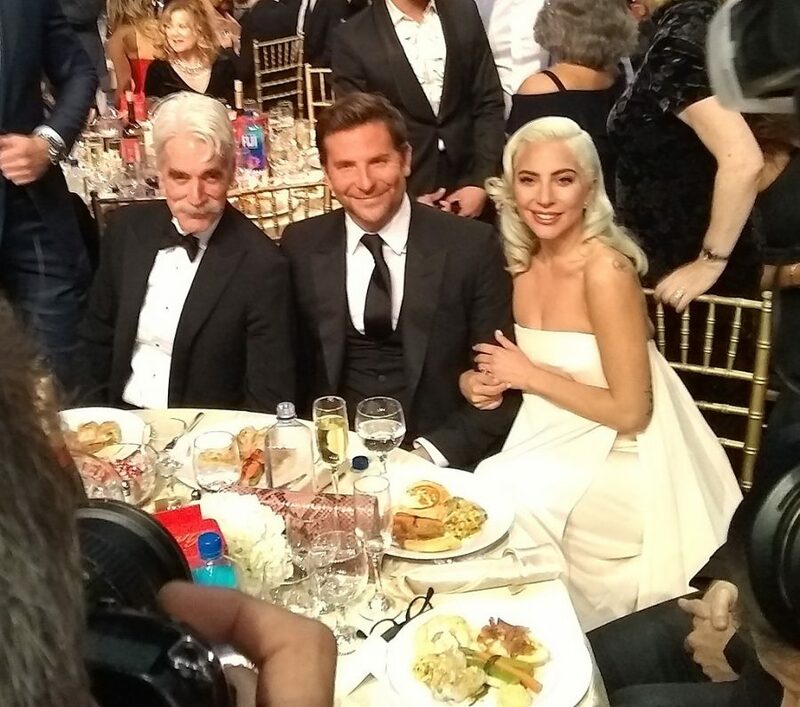 Actor Sam Elliott, Director/Actor Bradley Cooper, and Actor/Singer Lada Gaga at the “A Star is Born” table at the 24th annual Critics’ Choice Awards in Santa Monica, California on January 13th, 2019. Bradley Cooper, the film’s director, has created an amazing version of the original A Star is Born story by staring the amazing Lady Gaga. Viewers get to experience Bradley Cooper’s character tell the story of his problematic relationship with his father, falling in love with a no-body from a small town, and battling drug and alcohol addiction. This story makes the audience feel the true heartbreak Lady Gaga’s character experiences as a result of being in love with someone that has issues with drugs and alcohol. This story brings viewers through a roller-coaster of emotions throughout the movie. Ally (Gaga), a small town girl with a hidden talent for singing, is tired of working her average job at a restaurant. After she sings in a small bar she learns that the famous Jackson Maine (Cooper) had been watching her performance. Jackson Maine is a charming and amiable guy who doesn’t quite cut it at first for Ally. After he takes multiple opportunities to confess his love for Ally, she finally satisfies viewers by falling in love with Jackson. In the beginning of the film, Jackson has the audience rooting for him as he tries to win over Ally. However, toward the end of the film viewers begin to dislike Jackson because his addiction creates many problems in his relationship with Ally. For most viewers, it’s baffling that Ally stands by his side through Jackson’s journey through addiction, rehab, and relapse, but that’s what separates this love story from others. Most love stories end in a “happily ever after” scene, but A Star is Born is definitely the opposite. Gaga’s amazing performance of the love songs Ally wrote for Maine makes viewers want to sing along and leaves them listening to the soundtrack non-stop the next day. After watching the film, viewers are left wanting answers from Jackson. The movie tells an extraordinary love story but leaves us feeling incomplete. The plot features many shocking twists but also lacks many transitional scenes. The plot could also use a few scenes of down-time rather than making every scene action packed. Ally and Jackson go from being complete strangers to being married and getting a dog together in just a short amount of time. From a critic’s perspective, the plot told an admirable love story but could have had some small plot changes to really make viewers fall in love with the film itself. Overall, A Star is Born does an exquisite job of telling a story about an enormous problem all over America. Many people all over the country struggle with drug and alcohol abuse, and this film recognizes the pain of the family of those who are addicted. This film is dramatic, romantic, and puts true love into a real-world story which hits home for so many viewers. I recommend A Star is Born if you are looking for a film that will tug on the strings of your heart and also give you joy.